Hopefully you don’t suffer from galeophobia (fear of sharks) because TV’s longest-running and most-anticipated summer event returns from the deep for its 30th anniversary. After three decades, hundreds of shows, and thousands of pointy teeth, Shark Week 2018 celebrates their milestone with all-new jaw-dropping shark stories. Tune in (maybe with a chum?) and catch shows featuring unexplored locations and gain extensive insight into the mysterious world of sharks. This year’s eight-day event brings a celebrity-packed line-up and unprecedented access to some of the most exotic places in the world. In addition to team of renowned shark experts and scientists, all-star athletes and the Sharks from ABC’s Shark Tank are joining the fintastic celebration this year including Ronda Rousey, Aaron Rodgers, Rob Gronkowski, Lindsey Vonn, Mark Cuban, Barbara Corcoran, Kevin O’Leary, Daymond John, and Bear Grylls. The Shark Week frenzy premieres Sunday, July 22 continues through Sunday, July 29 on the Discovery network. Episodes are available on TV Everywhere and On Demand. 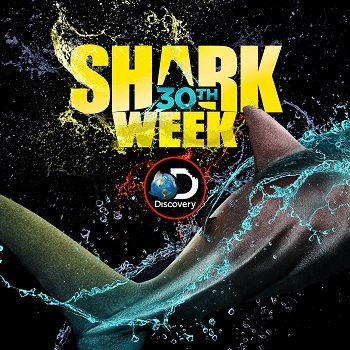 To gear up for this year’s event, you can watch full episodes of Shark Week Classics on Discovery’s website with fresh content being added through July. 1. Some sharks go out of their way to get a nice suntan. True or false? 2. Which shark tends to have glowing parasites hanging from its eyes? 3. What is the deepest-living shark? 4. Which of these sharks will stop breathing if it stops swimming? 5. Sharks have taste buds on their tongue. True or false? 6. Sharks have been around for how many millions of years? 7. Some sharks like to play games with one another. True or false? 8. What’s more attractive to a shark: a solid bathing suit or a striped bathing suit? 9. Which of the following sharks commonly travels in schools? 10. Some sharks walk instead of swim. True or false? 2. The Greenland shark lives most of its life in pitch darkness. Glowing or bioluminescent parasites latch on to its eyes, attracting prey that the Greenland shark eats. 3. The Portuguese dogfish has been found down to 12,100 feet below the surface. It’s one of the most common deep water sharks and the only shark abundant below 4,900 feet. 4. Whale sharks are one of only two dozen shark species that have to swim constantly in order to breathe. Angel sharks can rest at the bottom of the ocean and force air over their gills. 5. False. Sharks have taste buds lining their mouth and gullet, but not their tongue. In fact, it’s thought that most shark tongues are relatively useless. 6. Sharks have been around for at least 420 million years, potentially as far back as 455 million years ago. The first dinosaurs evolved only about 230 million years ago. 7. True. Sharks just want to have fun! Porbeagle sharks, for example, toss around chunks of seaweed in what resembles a playful game of shark football. 8. Sharks are attracted to sharp color contrasts, such as striped bathing suits and even uneven tan lines. 9. Scalloped hammerheads are one of a few species of sharks that school in large numbers – sometimes in the hundreds. 10. Bamboo sharks and epaulette sharks use their fins to “walk” along the sea floor rather than swim.